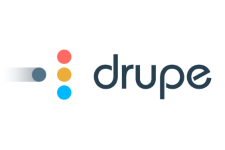 What apps does drupe feature? How can I organize the app icons? I think some apps are missing from drupe! Where are they? Can I add apps to drupe? How can I select my default app for the different action icons? How to use drupe's notes? I use more than one email account, how can I use them via drupe? How can I change the email address I signed up to drupe with? How can I send an email to my contacts? How can I use Facebook Messenger via drupe? Why doesn't drupe feature Facebook as one of the available apps? I synced my G+ contacts, but I still can't use Hangouts. What can I do? How can I use Hangouts via drupe?